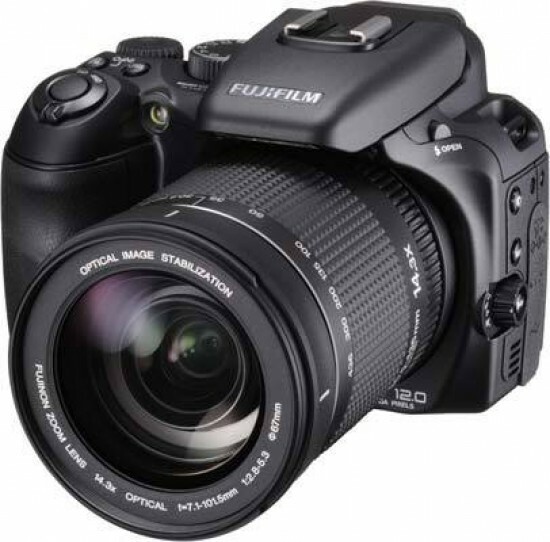 The Fujifilm Finepix S200EXR is a new super-zoom camera with a 14.3x, 30.5mm-436mm zoom lens, primarily aimed at people who want a DSLR experience without the cost and bulk of a true DSLR system. Replacing the S100FS model, the Fujifilm S200EXR inherits the innovative EXR technology that was first introduced earlier this year on the F200EXR. This essentially turns the S200 EXR into three kinds of camera in one, with one mode capturing the highest resolution possible, another the lowest noise, and the third the best dynamic range, with the camera also able to automatically choose the most suitable for the current scene. Other standout features include new Pro Focus Mode and Pro Low-light modes which take advantage of the S200EXR's multi-frame technology, built-in image stabilisation, 12 megapixel sensor, 2.7-inch LCD screen, electronic viewfinder, ISO range of 100-12,800, full range of creative shooting modes and the ability to shoot both a RAW and JPEG shot simultaneously. 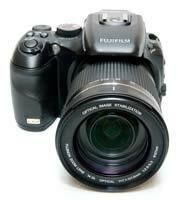 The Fujifilm Finepix S200EXR is available now priced at $599.95 / £399.99. 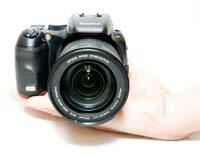 The Fujifilm Finepix S200EXR is virtually identical to the previous S100FS model in terms of its external design. The biggest changes are the removal of the tiltable 2.5 inch LCD screen in exchange for a slightly larger but fixed 2.7 inch screen - we'd rather have the S100FS' smaller but more flexible screen - and a slightly less wide-angle lens (30.5-436mm equivalent in 35mm terms). Offering itself as a jack-of-all-trades solution to the photo enthusiast, the S200EXR is a DSLR-styled camera with a non-interchangeable 14.3x zoom lens complete with manual zoom and focus rings. This versatile lens isn't particularly wide at 30.5mm, but it does offer respectable maximum apertures of a bright f/2.8 (wide-angle) to f5.3 (telephoto). Unlike some rivals the manual zoom and focus can also be accessed in the Motion JPEG format movie mode (offering 30 frames per second and VGA picture quality) with constantly adjusting auto exposure and focus, although disappointingly there's no HD movie quality on offer. JPEG or RAW images are committed to SD and SDHC cards (xD-Picture Cards are no longer supported) although there's no card supplied out of the box, with just the 25MB internal capacity to fall back on. To help avoid blur resulting from camera shake when shooting in low light or at the telephoto extremity of the zoom, Fujifilm have added a 'belt and braces' solution of high (ISO) sensitivity, here stretching up to ISO 12800 if you don't mind a resolution drop to three megapixels at that setting to limit the visibility of noise. 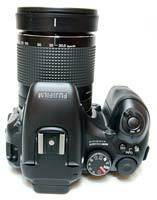 Also accessible at this resolution is a 6-frames-per-second capture speed, up to a maximum of 24 continuous shots. As you'd expect from a camera that falls between two stools, users also get the ubiquitous hand-holding features of face detection technology - Fujifilm's variety claiming to still be able to detect faces in profile or when shot from awkward angles, and up to 10 at a time in just 0.05 seconds - plus auto red eye removal, which saves both the original image and corrected file. You can get as close to your subject as 1cm thanks to the S200EXR' Super Macro setting (or 10cm in regular macro mode). The Fujifilm FinePix S200EXR looks, feels and handles very much like a mid-range DSLR – indeed the inclusion of a wide dynamic range of 100% to 800% and film simulation modes to achieve subtle changes in tone ape the manufacturer's one-and-only and very specifically targeted S5 Pro digital SLR – with a weight and a solid-feel build quality also that will withstand a few glancing knocks in the heat of the action. Overall the moulded curves of the body and matt black finish deliver a look that is as aesthetically pleasing as it is practical, with nice chunky controls and an ergonomic layout that allows both quick and easy access to functions and a firm steady grip into the bargain – though this is a camera for which you will very much need to use both hands at once. As we've established, from the front the S200EXR looks like a serious bit of kit, and indeed requires a degree of familiarization with the manual to get the best from, that large optically stabilised zoom lens dominating proceedings (with clip-on lens cap and strap provided). Above this and extending out across the lens barrel, which boasts a textured surround allowing you to get a good firm grip and achieve a smooth, steady zooming action, is an attractively sloping ridge that conceals the pop up flash (when not in use). Following the line of the slope to the right reveals a dedicated button for activating said flash. Still viewing the S200EXR from the front, bottom left of the 13-element lens is a sync terminal for additional flash, above which, and just snuggling into the top edge of the nicely-defined hand grip (with rechargeable battery pack at its base and indentation into which a middle finger slots comfortably), is the familiar dual purpose AF-assist illuminator and self-timer lamp. Looking down on the top of the camera we find a clearly labeled and logically laid out control set, with a chunky, ridged mode dial holding court in the absence of a top plate LCD display panel that might commonly be found on a DSLR in this price bracket. Ranged around the dial, which turns with just the right amount of resistance for it to lock firmly into place at each setting, are the expected shooting options, such as full auto, program, shutter priority, aperture priority and manual modes, along with two customizable modes (C1 & C2) via which favoured shooting settings can be saved for rapid access, plus a video mode and a scene position ('SP') mode pre-optimised for sixteen common subjects. The Natural Light mode forces the S200EXR to select a fast shutter speed in order to freeze subject movement more effectively, whilst setting a fast ISO speed without firing the flash for more natural results. It's an effective automatic way of taking photos of children indoors, for example. Natural Light and Flash is a little more exciting. When selected, the camera instantly takes 2 photos, one with flash, one without, giving you the option of which one to choose later (both are saved by the camera). The EXR shooting mode is by far the S200EXR's most exciting, headline-grabbing feature. There are three different EXR options. Resolution Priority (HR) mode uses all 10 megapixels to capture the highest resolution image, much like any other camera. High ISO & Low Noise (SN) mode combines adjacent pixels to create larger photodiodes and improve low-light quality, producing a 6 megapixel image that makes dark scenes as bright and detailed as possible with minimal noise. D-Range Priority (DR) mode simultaneously takes two images at different exposures and then combines them to produce a single 5 megapixel image with increased dynamic range (up to 800%), preserving detail in the shadow and highlight areas that would otherwise be lost. If you can't decide between the three modes, EXR Auto will automatically select the correct one for the current scene. In practice, EXR Auto picked the mode that I personally would have chosen about 90% of the time, so you can safely leave the S200EXR on this setting and not worry about having to keep changing the EXR mode. You can see the results of using the the different EXR modes for yourself on the Image Quality page. There is a side-by side comparison of the ISO speeds in Resolution Priority (HR) and High ISO & Low Noise (SN) mode, two examples which were shot using each EXR mode, with links to the original full size images, 100% crops and histograms, and an example which was shot using D-Range Priority (DR) mode at each % level, with links to the original full size images and histograms. Setting the camera to High ISO & Low Noise Mode produces slightly less noisy images at each equivalent setting, but the image resolution drops to 6 megapixels, the range is only 100-1600, and to be honest the difference between the two modes isn't as pronounced as we'd have hoped. The D-Range Priority (DR) mode is much more successful, resulting in images that have noticeably more dynamic range that those shot in the Resolution Priority (HR) mode, and far surpassing other compact cameras. If you want to shoot images that retain detail in both the highlight and shadow areas, this mode and this camera are made for you. The Pro Focus and Pro Low-light modes are also brand new additions to the S200XEXR, using multi-bracketing technology to create DSLR-like effects. Pro Focus takes up to three different exposures at different focal points and aligns them to produce a single frame with a shallow depth of field, while Pro Low-light takes a series of four high sensitivity/low-noise shots in quick succession and combines them into an image with less noise than the single exposures. You can see examples of both shooting modes on the Image Quality page. Things also get get interesting when we come to the next and last mode on the dial – namely FSB, or 'film simulation bracketing', which, as it suggests, allows the same image to be captured in different colours or tones, ape-ing the looks of Fuji's popular Provia or Velvia film (the latter offering higher brightness and sharpness), or alternatively opt for 'Astia', providing a romantic look with muted colours. Fujifilm have also added Black & White and Sepia modes to the S200EXR. Arguably this is one of the key features that sets the S200EXR apart from other contenders, and could be a decider for those who want that Fujifilm signature look and feel from a digital camera. Super Intelligent Flash is a rather grandiose sounding feature that is a little more specialised that its name suggests. It essentially throttles down the flash when taking macro shots, so that the subject isn't over-exposed by a blinding white light. Integrated into the Auto shooting mode, in practice it does produce quite effective close up shots that don't suffer from over-exposure, and which exhibit much less camera-shake when you're shooting hand-held (although ideally you should use a tripod for ultimate sharpness). To the right of the mode dial, looking down on the Fujifilm FinePix S200EXR, is a command dial for scrolling through features and captured images in a thrice that will feel immediately intuitive to just about anyone who has handled a DSLR. The same dial is also used to scroll through the available ISO settings, for which there is a dedicated button provided just in front of the dial. You hold this button down with your forefinger and give the dial a flick with your thumb. Adjacent to this is a second button for adjusting exposure compensation, which provides a visual of a slider graph on screen accompanied by a live histogram, a dual touch that is both unusual yet welcome. Alternatively, hold this same button down in playback to display capture information – again including a histogram. Forward of these two controls, teetering on the slope of the handgrip, is the main shutter release button encircled by an on/off power switch. Flick this to On, and the rear LCD or electronic viewfinder – depending on which one you previously had selected – blinks into life, a process taking around two seconds, which is obviously not as rapid as most DSLRs. Still, the Fujifilm FinePix S100FS is lightning fast to determine focus and exposure with a half press of the shutter button – when, obviously, in AF mode – and you only have to blink between the capture of one full resolution JPEG or RAW file and the next in single shot mode. That said, shooting RAW or the new combined JPEG and RAW does cause the buffer memory to seize up after three or four successive shots, forcing a camera shutdown and wait of around 4 seconds seconds while the files are written to card (a big improvement on the S100FS). To the left of the mode dial is the hump housing the built-in flash, with two tiny (and easy to overlook) holes for the built-in microphone nestling on its ridge. Above the flash is another DSLR-like touch: a hotshoe for additional illumination. And, apart from that and loops either side of the body for attaching the provided strap, the top plate is done. Moving to the back of the camera, your attention is immediately drawn to the 2.7-inch monitor. To the right of the LCD is a small button for swapping the display between monitor and 200k-dot resolution electronic viewfinder with surrounding eyecup, which has its own dioptric correction wheel to its immediate left. This control was far less stiff and indeed physically larger than usually found on competing models, meaning that for the myopic adjustment can be made in a faction of a second. The viewfinder display is itself large, bright and clear, though the temptation to predominantly utilise the more flexible LCD below is almost overwhelming. To the right of the screen and top right of the camera back is a self-explanatory AE lock button (doubling up as a file deletion button when in playback mode) surrounded by a ridged circular control for switching between multi pattern, spot and average light metering, which Fujifilm is calling its Photometry selector dial. By contrast to the other controls this one I found rather too small and fiddly to get an adequate purchase on, and stiff with it, though longer, stronger finger nails and less stubby fingers would doubtless help. Below this to the right is a playback button for retrieving captured images, sitting opposite the previously mentioned EVF/LCD selector. Below this again is a dedicated button for immediately calling up (or deactivating) face detection for portraiture, which also switches on red eye reduction. Also on the camera back is a familiar four-way controller with a dual-purpose menu/OK button at its centre. Ranged at north, south, east and west around this control are variously, a means of zooming in to check the detail of images, a means of selecting the varying flash modes on offer, selecting self timer, and a means of shifting focus from infinity to either macro or super macro. Press 'Menu' in shooting mode and you get a comprehensive choice of options from two main folders. To retrace your steps at any point there's one more dedicated button at the rear of the camera – another dual-purpose control marked display/back. 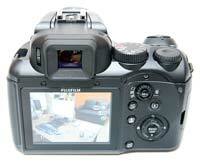 Fujifilm have included an image stabilisation system on the S200EXR. Activated via the Dual IS Mode Setup menu option, you can set the system to Continuous, Shooting Only or Off. The S200EXR's image stabilisation system uses a combination of mechanical CCD-shift and the use of high sensitivity settings of up to ISO 6400 to help keep shutter speeds high enough to avoid subject blur in low light conditions. Note that the camera will only automatically adjust the ISO speed when using the Auto shooting mode - in the other modes the ISO speed that you select will always be used, so only the mechanical CCD-shift part of the system is used. In practice I found that it does make a noticeable difference, as shown in the examples on the Image Quality page. You don't notice that the camera is actually doing anything different when anti-shake is turned on, just that you can use slower shutter speeds than normal and still take sharp photos. The right hand flank of the Fujifilm FinePix S200EXR features a flip-open compartment for the SD / SDHC card slot, while the left is positively bristling with more controls. , underneath this again is the White Balance button and a ridged circular control similar to the fiddly one on the camera back for swapping metering modes. Here it is at least less stiff and allows the user to select the varying focus modes – from continuous AF to single shot AF and then manual. Beneath this again are four strips indicating a built-in speaker, though you'd only know that from referring to the hard copy manual provided. Still at one side and just set back from these controls is a rubber flap hiding the S200EXR' various ports: from the top and running downwards these comprise a mains (DC-in) terminal, the regular AV out socket, and, thirdly, the expected USB socket. Finally, the base of the Fujifilm FinePix S200EXR features a screw thread for a tripod and a sliding door hiding the compartment for the chunky rechargeable NP-140 lithium ion battery back stored within the handgrip. Thankfully Fujifilm have addressed one of our main criticisms of the S100FS, namely its below-par battery life. Despite using the same battery, the S200EXR achieves 50% more shots per single charge, so you can expect to get over 350 shots with use of either the rear LCD or EVF.